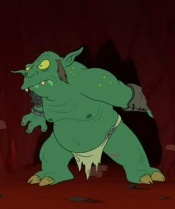 Peaches is a large, yellow-eyed, green-skinned monster, possibly an ogre, that aids Momon in slapping her sons Waltazar, Larius and Ignus, and fighting in wars. He owns a big flail, which, instead of an iron ball, has a huge glove at its end. Down in the dungeon just Peaches and me, a lyric in the song Now I'm Here by Queen, is probably the origin of his name. Peaches: I'm in the tub! This page was last edited on 4 January 2014, at 21:49.